It was on 22 December 1985, during a conference given at the Rockdale town hall in Sydney, that our venerable founder announced: “The Society is going to open up a seminary in Australia!” This news was greeted with an enthusiastic applause. In June 1986, Archbishop Lefebvre wrote to one of his priests, asking him to look for prefabricated buildings and a piece of land to put them on, in order to start the seminary. The investigations began. They resulted in the purchase of a piece of land in Eudio, Queensland, in February 1987, along with some prefabricated rooms in Yarraman. But 92 objections were raised against the project. The efforts of Fathers Hogan, Esposito, and Abdoo to quiet those objections at a public meeting of the community Council of Maroochy Shire ended in failure. Another piece of land was acquired in June at Tanawha, but by then the prefabricated rooms had been sold to a gold mining company! On 4 November, Father Lionel Héry, who had been appointed the first professor of the seminary, arrived and celebrated the first solemn high Mass at Tanawha. But the price quoted for construction on the site proved to be too costly! Then, Father William Welsh arrived from India in February 1988, having been appointed the first superior of the seminary. The then superior general, Fr Franz Schmidberger, came to visit in March, and the decision was made to rent a motel for a while in Nanango, Queensland. On 19 March 1988, the feast of St. Joseph, the first academic year began with a respectable number of 13 seminarians: 10 Australians, two New Zealanders, and one Indian. A few months later, the seminary moved to a group of houses in the suburbs of Nanango. The first taking of the cassock took place on 14 August at the Society’s church in Brisbane, with 13 seminarians and one brother taking the cassock. 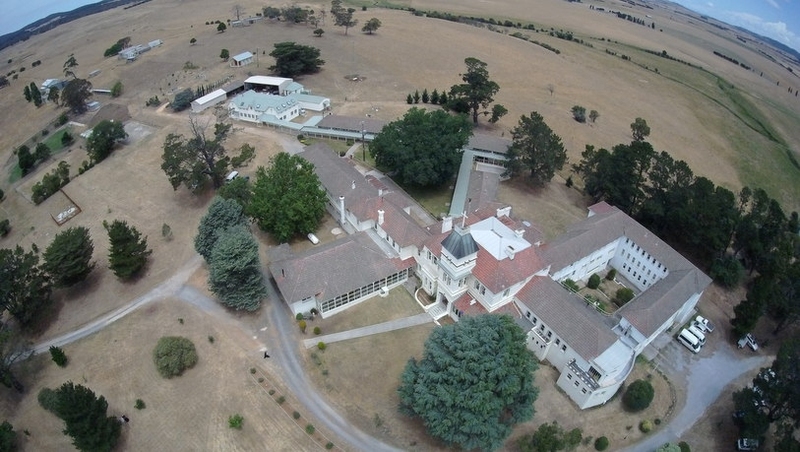 Providentially, Mr. and Mrs. Abdoo found a former college of the Christian Brothers, St. Michael’s Agricultural College, 25 km from Goulburn, on 12 May 1988. The college had been sold to a drug rehabilitation organization called “We Help Ourselves” and had fallen into a very lamentable state of disrepair. After some negotiations, the Society bought the complex on 8 July and began the work of repairing the buildings (work that continues to this day!). On 30 November 1988, the house became Holy Cross Seminary, and the first tonsure ceremony was held on 8 December. On 12 February 1989, Father James Peak arrived from Flavigny to take charge as rector, replacing Father Welsh. He would continue as rector for 11 years, completing his term in December 1999. During this time, there were between three and four priests stationed at the seminary, who generally had charge of quite a small number of seminarians. There were several reasons for this small number: the difficulty of obtaining visas for foreign candidates; the high rate of attrition among the candidates entering; the sending off of seminarians who had completed three years of formation to other seminaries; and the small number of candidates entering from the demographic area assigned to Holy Cross. In 1991, for instance, there were only three seminarians! Nine years later, the seminary was in a similar condition, with only four seminarians in formation. Despite these difficulties, Holy Cross Seminary persevered through the years. Fr Coenraad Daniels took over from Fr Peek in 2000, and Fr Peter Scott came in 2002 to seize the reins. In order to help make better use of the resources available at the seminary, Fr Scott opened a minor seminary, effectively a high school boarding school, in 2002. He also extended the seminary programme to a full formation, including theology as well as philosophy and so leading all the way to ordination. 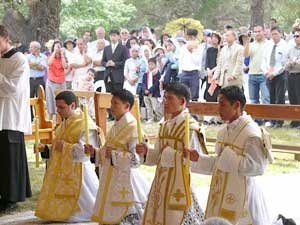 As a result, Holy Cross was blessed with having its first priestly ordination ceremony in December 2005, with 1 Australian and 3 Filipinos being ordained. After that year, 3 were ordained in 2006, 1 in 2007, 3 in 2008, 2 in 2009, 2 in 2015, and 3 in 2016, with the seminary briefly closing down the theologate again from 2010 to 2012. During that time, the minor seminary was also discontinued. Fr Vicente Griego became rector in 2008, to be replaced by Fr Daniel Themann in 2015. Happily, today, Holy Cross is thriving with a student body averaging around 20 seminarians.